Large group of flowering shrubs, most with showy flowers that are single-petalled to fully double petalled. Leaves are typically medium to dark green, glossy, and ovate, with finely toothed edges. Vary in size from 1/2 inch to 6 inches, five petals to more than 30, and in nearly every color. 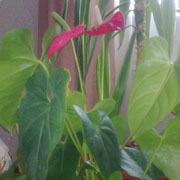 Often the flowers are very fragrant. Most varieties grow on long canes that sometimes climb. Unfortunatly, this favorite plant is quite susceptible to a variety of diseases and pests, many of which can be controlled with good cultural practices. 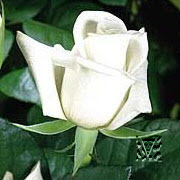 There are three different types of roses: bush, climbing and shrub. Rose bushes produce blooms at the top of the bush. They can grow from a few inches high such as miniatures or up to 6 feet tall such as hybrid teas, floribundas and rose trees. Climbing roses have long canes that can be trained to grow up a trellis or wall, such as rambler and trailing roses. Shrub roses make good hedges and are easy to care for. Some are disease resistant and winter hardy, such as the Knock Out rose. 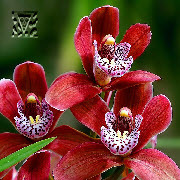 Orchidaceae, usually referred to as the Orchid family, is a morphologically diverse and widespread family of monocots in the order Asparagales. It is currently believed to be the largest family of flowering plants with between 21,950 and 26,049 currently accepted species, found in 880 genera. The largest genera are Bulbophyllum (2,000 species), Epidendrum (1,500 species), Dendrobium (1,400 species) and Pleurothallis (1,000 species).